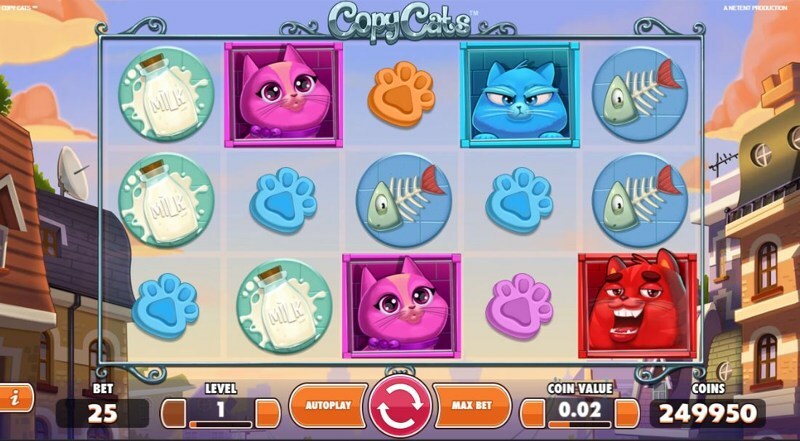 Copy Cats is a Net Entertainment video slot with 5-reels and 25-fixed-pay lines. Themed around the world of curious felines, Copy Cats offers dynamic visuals, with a wide variety of cats, presented in a cartoon-like state. Copy Cats can be enjoyed on all devices, and, thanks to the games HTML5 design, mobile players can enjoy the thrills of playing without having to download or install any software, plugins, or Apps. The game’s playable from as little as £0.25 a spin, with the max stake capped at £125 – a little less than we normally see from Net Entertainment, but enough to satisfy most players cravings, nonetheless. With the colourful, cartoon-like theme in mind, it makes sense that Net Entertainment chose to make the reel-symbols just as vibrant, and you’ll see four different-coloured Paw Prints acting as the low-paying symbols (a nice change from the playing-cards we normally see), as well as a pile of Fish Bones, Milk, a Wind-Up-Toy-Mouse, and three cats. The cats are the high-paying symbols, and come in three colours; red, pink, and blue. The other symbol to look out for is the Golden Cat (which is the Wild Symbol and substitutes for all other symbols in-game, excluding the scatter symbols). Whenever you land one of the four cats (the red, pink, and blue cats plus the golden wild cat) on reel one, any cat symbols that land on reels two, three, four, or five, will turn into the same cat that landed on the first reel. If you’re lucky enough to land the Golden Cat (the Wild Symbol) on the first reel, all subsequent cats will turn wild. It’s quite an intuitive, and unique feature, and while there’s a few games that offer a similar in-game bonus, few can pull it off quite like Net Entertainment. Thanks to the game being a low-medium variance design, you’ll see the feature fairly regularly – and while it’s not going to be paying wins of 500X… it doesn’t just offer 5X wins like some of the other lower-variance Net Entertainment slots we’ve seen. Now, while the in-game cat feature is pretty cool, we all know that no Net Entertainment game would be complete without a free-spins bonus… and Copy Cats is no exception to the rule. It’s possible to re-trigger more free-spins… but only once. You’ll need to land 3 bonus symbols on reels one, three, and five once again, and in return you’ll be awarded another 10 free-spins – but the bonus is capped at 20 spins.